Estimated Release Date: Autumn 2018; Please sign up below to automatically receive an email when this title is available. Legendary game designer, Sandy Petersen (Cthulhu Wars), is proud to partner with Chaosium and Moon Design Publications (Guide to Glorantha) to bring a colossal new chapter to board-gaming! 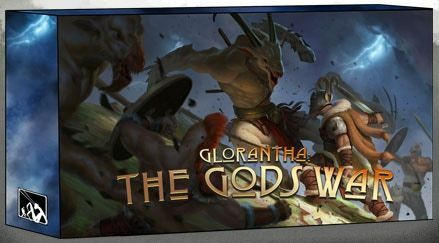 Glorantha: The Gods War is a new board-game taking place in the mythic universe of Glorantha, a fantasy setting beloved by fans for almost 40 years. The Gods War is a competitive strategy game in which 3 to 5 players summon minions and gods, build temples and shrines, and cast spells. The players go on heroquests, gather mystic runes, try to destroy their enemies, and capture their territory. Each faction has its own unique set of spells, mortal units, and immortal gods. Each copy of The Gods War will come packed in a sturdy box containing a durable, full color, double-sided map with 36 highly detailed miniatures (even more with additional planned expansions). The units are designed to a 28mm scale so they can also be used in other tabletop games. They range in size from normal humans up to colossal pieces - larger than any game pieces we’ve encountered (aside from the legendary Cthulhu Wars). We believe the quality of these miniatures will speak for themselves. This game is for people who appreciate first-rate components in their gaming experience.